Morning drive from Islamabad to Muzaffarabad (Azad Kashmir). Arrive and transfer to the hotel in Muzaffarabad. City tour of Muzaffarabad. Overnight at the hotel. Breakfast at the hotel. Proceed for full day excursion to Pir Chinasi. Overnight at the hotel in Muzaffarabad. 11	Besham - Taxila - Islamabad. 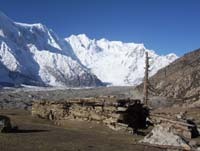 For the first time in 1856, Captain Montgomery conducted the first ever survey of Karakoram and named the peak K-2 locally known as "Chogo Ri". He also determined its height. In 1861 Captain Godwin Austen explored and mapped the great glacier region comprising the Chogo-Lungma, Kero-Lungma, Biafo, Panmah and Baltoro. He was the first to traverse most of these glaciers to discover the approaches to K-2 and to sketch it topography. He named K-2 as Mount Godwin Austen. In 1902, first attempt to climb K-2 was made by a six men group of European climbers led by an English man Eckenstein. They could climb up to 6600 M.
In 1909, the Duke of Abruzzi (Italy) led a large expedition to Karakorum. Their attempt to climb K-2 failed at a height of 7500 M.
Northern Areas of Pakistan is the most spectacular & fascinating region of Pakistan. Here, world’s three famous mountain ranges meet the Himalayas, the Karakorams & the Hindukush. The whole Northern Areas is like a paradise for mountaineers, climbers, trekkers, hikers & anglers.